Chuck Jones created Marvin in 1948. Originally Marvin's character was just labelled Commander X-23. He was never intended to be a main Looney Tunes character; merely an extra. Who'd have thought?! Marvin then came into his own fame and recognition as a character, with an eager canine as his companion. 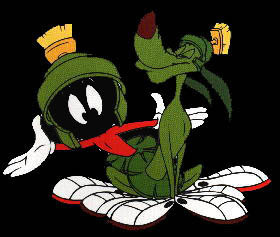 The very talented Mel Blanc was the voice of the little Martian until Mel died. Bob Bergen and Joe Alaskey have since assumed the remarkable voice that we have come to know and love. Marvin has something to say to you. Click here! He is determined, focused, a faithful friend and his height does not detract from his confidence or self-esteem. He believes that he can achieve anything if he puts his mind to it, and that's a motto for everyone to live successfully by. Perhaps not to the same level as Marvin! It's hard to pick just one, but I am rather partial to the scene in which Marvin creates the instant martians, and just generally his interaction with Duck Dodgers!